A powerful winter storm moved into Colorado late Wednesday, producing steady snow at both Vail and Beaver Creek and depositing 5 inches of new snow at both ski areas as of 5 this morning. The snow should continue throughout the day today, getting quite heavy later in the afternoon and lasting throughout the day Friday and into Saturday. 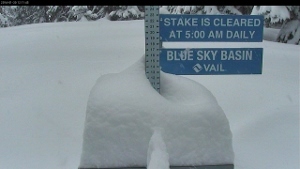 Snow was piling up rapidly by noon today (Vail Resorts photo). “Snow has been falling at 1-2 inches per hour along I-70 since at least 4 a.m. and it doesn’t show signs of letting up,” Opensnow.com meteorologist Joel Gratz reported just before noon today. “The latest models show that a stronger wave of energy will move through late this afternoon and tonight. More than 2 feet of new snow is possible by Saturday morning, forecasters say. “An Avalanche Warning is issued for the following zones: Steamboat, Front Range, Vail-Summit, and Sawatch,” the CAIC warned. “Snowfall developed Wednesday night with widespread 6 to 10 inch accumulations reported at 5am. Heavy snow is likely to continue through Thursday with another 8 to 12 inches predicted by this evening and additional accumulations overnight. Following an avalanche in the East Vail Chutes on Jan. 7 that killed Tony Seibert, the grandson of Vail founder Pete Seibert, there has been discussion throughout the community about possible backcountry closures. Proponents of backcountry access are advocating for increased education and extreme caution when exiting the ski-area boundary. Go to Rocky Mountain Post for more information.